Could I live without my smart phone? Sure I could. Would I want to? Not exactly. But I certainly don’t rely on it the way I rely on my own family, friends and self. Which brings me to Addie, who at the tender age of 7 insists that she NEEDS a phone. Honey, I can barely comprehend how much cell phones are, it’s sweet that you want to pay for it yourself, but while mom and dad pay for your phone usage? Use it and abuse it. It’s a lot easier for her to comprehend not needing a phone since Cody and I didn’t have them until recently, but that doesn’t satiate the desire to have one. I don’t even have a cell right now, let alone a smart one. It is not an expense we can justify. It is amazing to me just how many children and young teens have iPhones and Blackberrys and other smart phones. I am not sure at what age we will allow our kids to have a cell. It surely is a different world from what we grew up in isn’t it? I would also tell my high school students that I didn’t have a cell phone until my senior year in college and even then I NEVER took it out with me. They were in shock and awe horror of such thoughts… the idea that you actually went where you said you were going and everyone just showed up too is a mystery to them. I agree though that at the time they are more involved in after school activities and “on their own” having direct contact with them will be just as important to them as ME! I got my first official smartphone, with an actual data plan last year (Windows 7). I got it for free, courtesy of BzzAgent. Otherwise, I probably wouldn’t have gotten it until recently when I upgraded to my Inspire (Android). I’m not really on the go, but I’m on the internet A LOT, and now that I’m working for an online forum (I get paid and everything *woot*), I need more access. Plus, my family lives in IN while I’m in KS, so it helps to be able to share on the fly, without having to wait for an MMS message to be converted. I can just e-mail them, right there, and share that way. My kids get more excitement over my Kindle Fire than they do a phone. They like to play games, and they can see it better on that. They want laptops before they want phones. I’m saying no on those, period, until they’re over the age of 13, minimum (9 & 7 now), because I feel like I could trust them a little more, plus they’d have a bit more maturity there. They already have Facebook’s but we set those up for them. My 10 year old has a cellphone – between going back and forth between my house and her dad’s, and the volume of other ten year old’s calling my cell (no land line) and gymnastics schedules that keep her in the gym many hours a week… it made sense. Parental controls are set as to when it can be used. And it’s plugged in downstairs every evening at bedtime to eliminate use all night… Is it the route I thought I’d go? Nope… but it works for us. 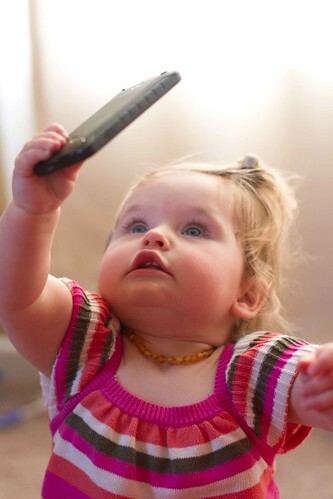 We’ve decided our girls will have a cell phone when we decide we want them to have one for OUR convenience. And then it will be pre-paid with enough minutes for us to reach them to check in/make arrangements. Any other activity will be paid for by them.